The Emerald Coast Blues Brothers will be performing at Bands on the Beach on Tuesday, October 29th from 7-9 p.m. at the Gulfside Pavilion at Pensacola Beach. 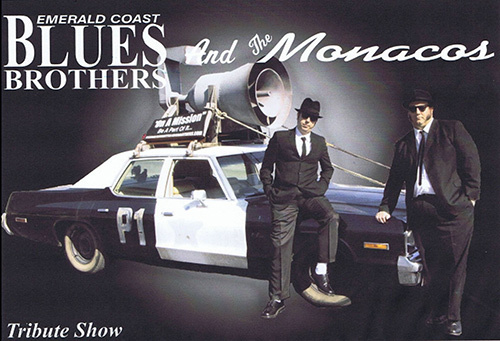 Terry Akens as Jake and Teddy Lehmann as Elwood, better known as the Emerald Coast Blues Brothers and the Monacos, have been performing tribute shows along the Gulf Coast (Louisiana to Florida) for many years. Their high-adrenaline show has opened for such acts as Percy Sledge, Bobby Blue Blend, Sugar Hill Gang and many more. This show is very traditional to the movie and music featured in the the original film, including a movie-authentic Blues Mobile.